We are now in to our 4th or 5th round of Supper Club, so that must be well in to our 3rd year. How time flies. We are down to 6 at the moment & 1 month less does seem to make ones turn come around so much quicker. This time round a little bit of a theme transpired. I find it a little strange how it all comes about, what the menu will be seems to take on a journey all of it’s own making. More often than not it meanders from here to there & what I think it may be a few months out bears little or no resemblance to the final destination. I may fixate on one dish that I am determined to try & everything else builds around that or I may be going through a bit of a phase, Mexican, Italian, French or anything else that may be my particular flavour of the month. It may be a new cookbook that has entranced me, oddly I haven’t had an Ottolenghi themed Supper Club. The menu seems to meander here & there in my head and then it settles & somehow it all comes together in the end, seemingly all of its own accord just as it should be. As this is being hosted by Lucy, only right that a little kitty cat makes an appearance! This time round South American transpired as flavour of the month, post a South American grilling class at Cook the Books & a new cook book The South American Grill. I think it appealed because it was all new to me. The appeal of trying several new recipes piqued my interest & from memory South America had not yet featured at Supper Club, so new flavours for everyone to try. If you don’t have fresh passionfruit you could use passionfruit syrup just reduce the condensed milk & add a little more lime juice to offset the additional sweetness. I do like dessert with a little more of the tart so even with fresh passionfruit I upped the lime juice a little & threw in the zest for good measure. Place the cream in a large bowl & whisk until you have soft peaks. In a separate bowl add the condensed milk, passionfruit juice, lime zest & juice & mix well together. Add the passionfruit mixture to the cream & gently fold it in. Pour in to 1 large or individual glasses & refrigerate for at least one hour. Drizzle with some passionfruit pulp & serve. This is so quick to whip up & it is light & fruity, the perfect sweet yet slightly tart treat to end a meal. 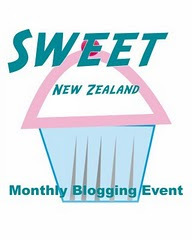 This is also my entry for this month’s Sweet New Zealand being hosted by Lucy The Kitchen Maid. Ooo this looks really delicious and reminds me of the many delicious dishes that Brazilians make with fruit!